Google launched the new security feature for their users to improve the security of the Google services. Now a days Phishing becomes the biggest threat to the Internet and everyday millions of spam mails sent out by the criminals to get some credentials from the users. Phishing pages are looks like the normal pages but they are designed to steal the Password of users and you may not know even after your account has been compromised. Once you have installed and initialized the Powerful Google Chrome Password Alert Extension to your Google Chrome browser, chrome will remember the scrambled version of the password for security purpose only and doesn’t share with anyone. 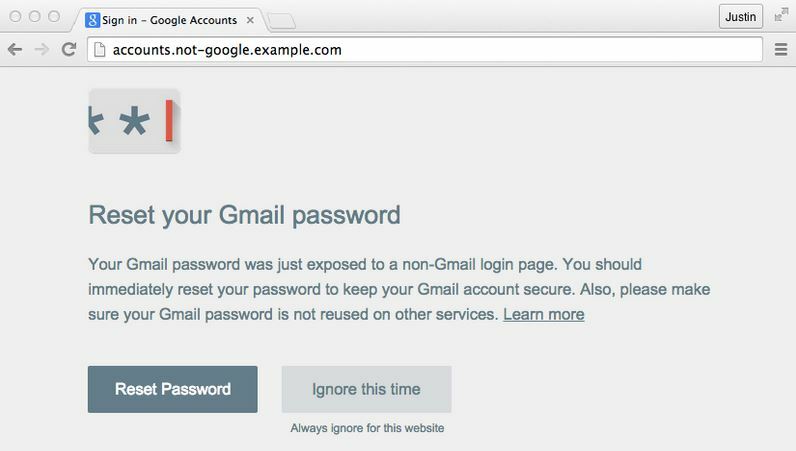 If you Type the password into site which is not the Google sign in page, Password alert will prompt you alert message as following that, you are at risk of being phished. So you have to immediately update your password to keep your account secure. Google chrome password alert is also available to Google for work customers including Google apps and drive for work. Domain admin can install the feature for the everyone in the group. It helps to protect the employee account in the organization. Google also offers the security tools like 2 steps verification and security key to stay safe and secure online. Google Password Alert for chrome is tested well before launch and users really appreciated the security feature (Against Phishing) launched by the Google.